Guess you could say I could hold my own in arithmetic in grammar school and I do remember that the whole equals the sum of its parts. Where am I going with this thought? 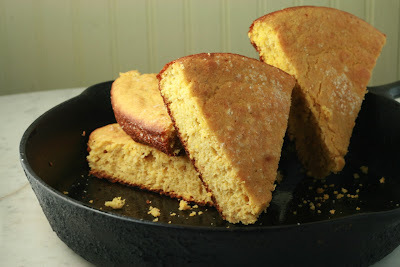 Well, when you are talking to most Southern cooks they will tell you three values, when added together that exceed the whole: simple cornbread batter + cast iron skillet + hot oven=A+. Oops, I think I am mixing Math with grades(not my math grades), but I don't think it is anywhere near mixing apples with oranges. 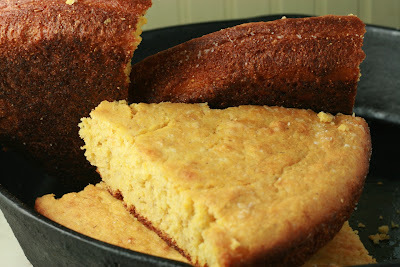 I'll take an A+ and a wedge of cornbread, hot from the oven. Most Southern cooks will usually tell you that a well seasoned cast iron skillet is like having a best friend---you always want that friend around. 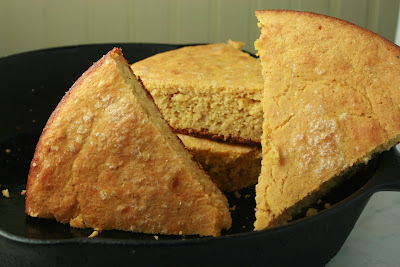 Some Southern cooks are lucky and the prized skillet is passed down through the family. But if you were not one of the lucky ones, and you have to purchase your own, Lodge has a good product line and I have seen used ones at flea markets and thrift stores. You will be surprised at how inexpensive they are. They can take as much rough handling as you can give them. They work hard in high heat and stand up to and defy heat. What they can't take is soaking in water or soapy water. Rust is not your friend in the kitchen. By now you are wondering when I will shut up and post the darn recipe. Okay, alright, already. 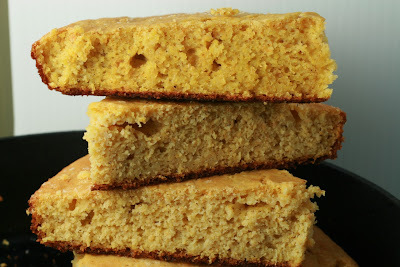 Please pass the cornbread! In a 10-inch cast iron skillet, add a tablespoon of Canola oil and preheat the skillet. You can either heat the skillet in the hot oven or on top of the burner/element. In a medium sized bowl, stir the dry ingredients to mix; add buttermilk, egg, and drippings, mixing just until dry ingredients are moistened. Pour into the greased, hot skillet. Bake in preheated hot oven at 450 for 20-25 minutes. Serve warm with butter.